I have often watched on television as the President’s wife leans over and whispers something in the President’s ear at some dinner or event. You will see him nod or smile and you kind of wonder what that was all about. I’d love to be a little bird flying by who overhears some of those private conversations. It’s quite something to have the President’s ear. Think about it. The President of the United States is the most powerful leader on earth and if you have his ear it means you have tremendous influence with power. If you said; “Please meet this person” or “I’d like you to consider this program” he most certainly would agree to it. But there is One who’s ear I would a thousand times rather have near enough to whisper to and that is God Almighty who created heaven and earth and who holds ALL power in his hands. The remarkable thing is that this is possible. We can actually be on such an intimate basis with the Lord that we can lean over and whisper in his ear. This type of intimacy is worth pursuing. Mary, the mother of Jesus had such a relationship with her son and there is a beautiful picture of it presented in the scripture. They were at a wedding together. Mary somehow found out the hosts had run out of wine. Understanding how embarrassing this would be for them she wanted to help and she knew who to turn to. She said very simply to Jesus; “They have no wine.” She didn’t offer the solution; only the problem. When we give a problem to someone very powerful that’s how it is. We realize we aren’t the one who can solve the thing. It is enough that we are whispering the problem in the ear of one who can. Jesus didn’t come right back with; “I’m on it Mother, say no more.” In a way, he sort of teased her; “Woman, what does your concern have to do with Me? My hour has not yet come.” But Mary knew she had her son’s heart so she simply said to the servants; “Whatever he says to you, do it.” (John 2:1-11) There was no doubt in her mind that Jesus would somehow provide more wine. And he did. He turned six stone pots filled with water into wine that was far superior to the wine they had served in the beginning. This story of the wedding feast at Cana is told many times to accentuate the miracle of turning water into wine. I think it is significant to remember that this miracle started with a simple request by someone very dear and intimate with the Lord. Someone who had his ear. Wouldn’t you like to have his ear? We can develop such intimacy with him. The more time we spend with him the more our eyes will be open to every nuance of his personality: his power, his graciousness, his kindness, his love. If knowing him is the highest priority we have in our life he will not push us away but will draw us in ever closer. He longs to have us close enough that we can whisper in his ear. 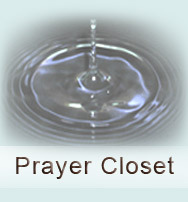 It seems to me that prayer born out of this intimacy is the most powerful sort. It is the kind that can move mountains and produce the most impossible kind of miracles. If you are looking for powerful prayer, look no further.